Monte Carlo Yachts created a timeless style, establishing new standards in the boating industry. 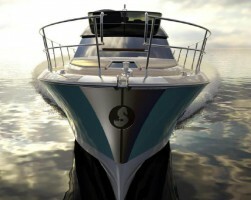 Today, this style is also that of the Monte Carlo, By Monte Carlo Yachts, By Beneteau. The expertise of the greatest boat manufacturing group in the world and the magical lines of Nuvolari and Lenard, in collaboration with Pierangelo Andreani for the layout and interiors, have given rise to a new approach to luxury. Come to Dusseldorf and discover the MC5, which is ready and waiting. You will be met by elegance, sophistication and quality. This new Monte Carlo range is the fruit of a special collaboration between Beneteau’s design office – whose know-how in the design of the hulls is second to none – and the designers, Nuvolari & Lenard, who lend their unique talent to the style, as well as the whole interior layout, in addition to the designer, Pierangelo Andreani, for the layout and interiors. Designing a classic and yet innovative style capable of translating into concrete form the need for more responsible boating and re-examining the value of using luxury goods, together with the decision to combine the industrial know-how of this French Group, World leader in leisure boating, and the quintessence of Italian boat design, gave birth to the MC5.